The event was organised by CENER, Spain’s National Renewable Energy Centre, and Greenovate! Europe, in the framework of the EU-funded BIOrescue project, which is developing a new biorefinery concept to recover used mushroom compost and other agricultural residues. As part of this project, experts are creating ground-breaking bio-based products such as tailor-made enzyme cocktails, biodegradable nanocapsules for targeted drug delivery, and low cost biopesticides. An explanation of each product’s characteristics, performance and applications was provided to workshop participants after a brief introduction of the project and biorefinery concept. “In BIOrescue, we look of course at creating a circular economy in the mushroom industry, but we also see the numerous opportunities beyond”, says Inés del Campo, Senior Research and Development Engineer and Project Manager at CENER, and coordinator of the BIOrescue project, “In that sense, our biorefinery concept will be replicable with other types of agricultural residues, and thus relevant for other industries that generate large amounts of biomass waste”. 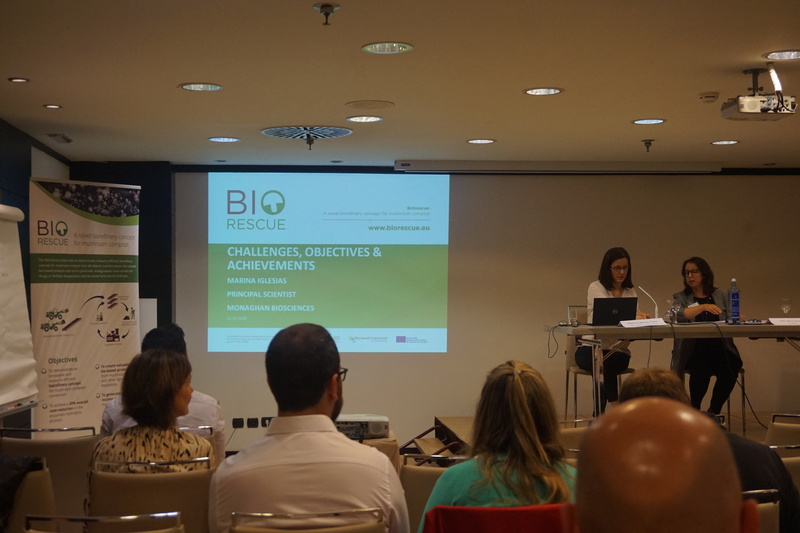 For the 40 participants, this workshop was also the occasion to explore the latest European and Spanish funding opportunities for the bio-based industry sector. To help attendees finding their way through the existing programmes and foster the development of new initiatives in the bio-based industry sector, Eduardo Cotillas and Marta de Diego from the Centre for the Development of Industrial technology (CDTI) introduced the different Spanish Research, Technology, Development and Innovation funding instruments, and presented European initiatives from the Horizon 2020 programme. Special attention from the audience was paid to the Bio-based Industry Joint Undertaking, the public-private partnership under which the BIOrescue project is funded. Looking at the public money invested in the sector and the emerging market for future bio-based products, certification and standardisation measures will be necessary to ensure the development of a truly sustainable bioeconomy. The Spanish Standardisation Body (UNE) is working in close cooperation with its European counterparts to take on this international challenge. Together they are developing solid and consistent standards for the bio-based market and thus facilitating the adoption of more sustainable consumption practices by citizens, industry and public bodies, explained UNE’s Head of Knowledge and Education, Daniel Massó. This is no easy feat however. The bio-based industries bring together different sectors into innovative value chains and the difficulty will be to bridge the gap between standards from distinctive areas and develop a coherent framework for bio-based products. The example of bioplastics, mentioned by Belén Pascual, Head of the Research & Development Department at ErcrosBio, shows that different levels of standards are needed for products to be both biodegradable and compostable, and thus have a truly circular life cycle. In the final year of the project, BIOrescue experts will study the full life cycle of their products and processes, to demonstrate their positive impact on rural economies, and especially on the environment. Then BIOrescue is set to launch the next generation of bio-based products and processes for the agro-food market and help establish a sustainable future for the mushroom industry. You can find here the agenda, handout and presentations from the event. This press release was published on BIORESCUE project website.